Do you wonder what drives an artist? What’s the motivation to keep painting? For me it is about the color and the diversity of the landscape and wanting to share those images you see with others. And why paint en plein air? I think it is painting “true.” Nothing is in your way of what you see. There is no excuse to what you put on that board or paper. It is right in front of you…it’s your interpretation! 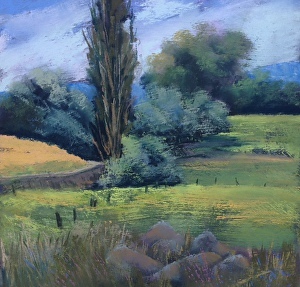 I had the opportunity to be part of a plein air event in Walla Walla a week ago. It was a 5 day paint out organized by a tiny 90-year-old watercolorist, Margaret Walters. About 20 artists came together for the event, painting it partly or in total. I think this was the third year of the event and there were several painters who had been on all tours. The event ended with an art sale that benefited the Carnegie Picture Lab. It was certainly a stress-free, enjoyable schedule and people to paint with. Each day a new venue…one favorite was going to this beautiful farm/vineyard at the base of Cottonwood Canyon. It is a favorite of mine and to be able to drive up through the farm to a high point and paint it from a different vantage point was great. Another day of endless opportunity was painting at the Robison Ranch north of town. I found a secluded spot where I painted two pieces. The only thing that drove me out of the field was the heat creeping up to 104! These two venues, for me was what painting plein air is all about….you could stand in one spot and paint in any direction…the dilemma is…what do you paint! A note about the Picture Lab…it is an art education program for area students. It is a nonprofit that depends on funds from outside sources. Commissions on sales of the plein air paintings benefited the Picture Lab. Happily 4 of my 6 paintings sold for this great cause. July 11th I will be painting in the Art of the Beartooths, the fund raiser and painting event and sale to support the Carbon county Art Guild in Red Lodge, MT. We will be painting a quick finish during the day that will be auctioned that evening. 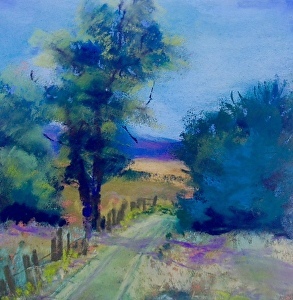 Off to the beautiful area around Hood river, OR for the Columbia Gorge Invitational Plein Air event. About 30 artists have been invited to paint August 3-7 in the area with a reception Friday the 7th, 6-8 pm. This entry was posted on Sunday, July 5th, 2015 at 9:19 pm	and posted in art, art sale, artist, artists, landscape artist, landscapes, pastel artist, Pastel Dust, pastels, recent works. You can follow any responses to this entry through the RSS 2.0 feed. I always feel tired after reading about your busy schedule but I know it energizes you! I admire how much you & your art do for worthy causes.